Super easy drinking Amber Ale with a great balance. Not too malty. Not too bitter. It’s just right. 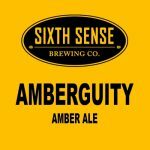 Amberguity will leave no doubt in your mind that you will order a second and third pint.